The CEFR offers an excellent start for all business English programs. It supports the design, teaching and assessment of foreign language proficiency. As the CEFR is so well established, your company is probably already using it. The Common European Framework of Reference for Languages (CEFR) is a scale indicating your language competency. It provides a globally accepted platform which trainers, learners and managers can use to determine a person’s language skills. In fact, as the CEFR is so well established, your company is probably already using it. The CEFR is not specifically focussed on business-related communication. The CEFR levels are broad, impacting their suitability for assessing the progress of professionals with limited training availability. The number of hours required to see a change in levels according to the CEFR is often unachievable for busy professionals. Using the CEFR levels to assess progress can be frustrating for learners, their managers and trainers. 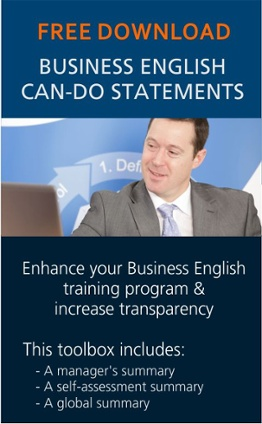 Developed in 2010, the Business English can-do statements relate to your actual needs and focus on the skills you need for your job, focusing on general and academic communication scenarios. The can-do statements are available in three levels of detail, meeting the needs of managers, HRD, learners and trainers. We’re happy to help, if you’d like further information about how the CEFR can be adapted to meet your business communication needs.